Number of Growers: 50 independent growers, 115 coopérateurs plus an estimated 2,500 non professionnels who make wine for private consumption. With around fifty growers marketing their own wines in the appellation, and not all of them tasted and visited, this list should be seen as representative rather than definitive. It’s good to be able to include the Cave Co-operative in the line up, as certain wines within their range is as good as any available from the individual growers. Given the nature of the wines produced here and their general availability outside of the region, let alone France, I have elected not to list specific wines, either in my profiles, or as Top Ten Wines to Buy Now. The Auvergne might be referred to as the belly of France or its green lung, but it also sits at the very heart of the country; central, but ultimately remote. For the English speaker, it remains the least known and understood of all of France’s Regions; the lack of reference books and guides bears testament to this. It is profoundly rural and mountainous and an area to avoid in winter when weather conditions can he harsh. The locals, or Auvagnats, as they are known, like to think of France as ‘the Auvergne with a little bit of land around it’. They have a reputation for being strong, hard-working and resourceful, but also for being suspicious, frugal, shrewd and thrifty; a legacy of the poverty once associated with its small and dispersed communities where depopulation was seen as habitual, as unskilled labour was forced out of the region to find work elsewhere. This mass migration helps to explain how the cuisine and culture of the Auvergne has been carried far within France. Many Auvergnats own cafés and bars in Paris, making the capital a ready market for the region’s produce, in particular its wines. Yet, despite spending most of their working lives outside of the region, it is the ambition of every Auvergnat to return, in retirement, to their homeland, often to settle in some of the most inaccessible corners. It is important to understand the distinction between the Auvergne, the Region, which encompasses the four departéments of Puy-de-Dôme (63), Allier (03), Cantal (15) and Haut-Loire (43) and that of the Côtes d’Auvergne, the name given to the appellation that exists exclusively for the wines produced in the département of Puy-de-Dôme. Historically wine was produced in the Haut-Loire, although this is now more famous for its Puy lentils which carry their own Appellation Contrôlée, whilst vineyards do still exist in the Allier département, on the slopes around the town of Saint-Pourçain. This report, however, covers the wines of the Côtes d’Auvergne specifically and the département of Puy-de-Dôme more generally. Clermont-Ferrand, the region’s capital, is a commercial and industrial centre of 250,000 people and is the only major city within the Region. It has been dominated by one significant enterprise; the tyre manufacturer, Michelin, who literally set up shop here in 1832 and at one point during the 1970s, employed 10% of Clermont’s working population. It is a relatively undistinguished place, with little to attract the tourist. At its centre is the twin-spired early Gothic cathedral, a huge black edifice built out of black Volvic rock. But beyond this single conurbation, the Auvergne is largely devoid of population. The Auvergne is the largest volcanic area in Europe; largely mountainous and geologically varied, in parts it resembles a lunar landscape with all its peaks and craters. The Region is dominated by two separate ranges of dormant, rather than extinct volcanoes, last active between 7,500 and 13,000 years ago. To the east and overlooking Clermont-Ferrand are the Monts Dômes, otherwise known as the Chaîne des Puys, a vertical line of well defined peaks which form the geological vertebrae. Arriving from the north, the peaks rise out of the fertile prairies of the Bourbonnais plateau and look foreboding from a distance, although the reality is that they are verdant slopes, covered in forests and mountain pastures. The most famous of these is the Puy-de-Dôme, which gives its name to the département and at 1,465metres is the highest in the chain. The Celts considered this a religious site where they worshipped their God of War. Until their volcanic origins were confirmed in 1751, it was believed that the Mont Dôme range was part of some gigantic Roman fortification. This volcanic skyline rarely tops 1,000 metres, but it helps provide an effective barrier to the westerly weather patterns that would otherwise determine the region’s climate. Further south, in the bleak and depopulated southern Auvergne and well away from any vineyards, lay the three giant cone volcanoes of Puy-de-Sancy, Banne d’Ordanche and the Puy-de-l’Aiguillier, which go towards making up the Mont Dore range. These are the glaciated remains of volcanoes that date back 3 million years to the end of the Tertiary Period, although the glaciers themselves only retreated at the end of the last ice age, 10,000 years ago. The highest peak is the Puy-de-Sancy which, at 1,885 metres, is also the summit of the Massif Central as well as the source of the river Dordogne. To the east of these two volcanic chains and running parallel is the Limagne, a fertile and climatically mild plain which follows the course of the river Allier for 140 kilometres, passing to the east of Clermont-Ferrand. Vineyards run along the western side of this 25 kilometre wide, topographic trough, known as a graben. It was formed by opposing sets of faults in the rock during the Tertiary Period, creating a rift valley which has since been exploited by the channelling of the river Allier. The Limagne is made up of rich, deep, black volcanic soils, alluvium deposited by the run-off from the mountains and carried down after the last ice age. It’s been one of France’s wheat belts for centuries, but cereals compete with other crops, such as sugar beet, maize, potatoes, tobacco and historically, of course, the vine. The Limagne basin was, for 2000 years, covered by a 30 metre deep lake, and occasionally one encounters some rocky outcrops of basalt in the centre of the plain, like at Pont-du-Château on the banks of the Allier, which was created when hot lava came into contact with the muddy waters. The Côtes d’Auvergne is the vineyard area of any significance closest to the source of the Loire although, as already mentioned, they are actually located in the valley of the Allier, the Loire’s most important tributary. It’s an isolated wine region, and its link to the greater Loire is a tenuous one, with the Auvergne better recognised for its contribution to culinary France than for its viticulture. Once outside its borders, restaurant tables are more likely to carry bottles of the regions waters: Volvic, Vichy-Saint-Yorre and Châteldon, than its wines. It is estimated that there are 2,200 hectares planted in total in Puy-de-Dôme département, of which around 250 hectares are Appellation Contrôlée, and a further 150 hectares dedicated for the production of IGP Puy-de-Dôme. But the Auvergne remains a quiet backwater where, in some parts, self-sufficiency is a part of rural life, meaning that there is a huge deficit in undeclared vineyard plantings, where smallholders maintain a few rows, en culture familiale, making Vin Ordinaire, specifically for their own table. The bottled wines have a ready local market in Clermont-Ferrand and on the tables of the provincial restaurants, who pour the wines of the region for tourists who come to walk on the mountains or take the waters at its spa towns. With the exception of the Parisian market, the wines are little seen outside the département, and even the Cave Saint-Verny, the sole co-operative, which accounts for half of the regions official production, sells 60% of its output within the Auvergne Region itself. Whilst a token amount of mostly undistinguished white wine is produced, this is essentially a region for red and rosé, and thankfully the majority of growers have not lost sight of the quality potential that can be gained from the Gamay grape, or the style of wines that can be produced that best express their soils and growing conditions. Until 2011, the wines languished under the lowly V.D.Q.S. status, despite the overall quality in the Côtes d’Auvergne being better than the other notable Gamay producer in the Loire, the Côte Roannaise. The Auvergne is probably the oldest inhabited region of France, although its overall remoteness and lack of population density has meant that this is a region that has been defined over the ages by outside influence; linguistically, it leans towards Occitan as its trading partners (and conquerors) have arrived from the south and north-east, by way of the Mediterranean, the Rhône and Burgundy. To the west, the natural barrier created by the mountains of the Massif Central ensured that influence from Atlantic France over the centuries has been nominal. The name of the region is derived from the Celtic word Arverni, the name of the Gallic tribe installed here well before the arrival of the Romans. In 52BC, and early on in Caesar’s conquest of Gaul, he was defeated on the slopes of Gergovia, a Celtic oppidum just south of Clermont-Ferrand by Vercingétorix, chief of the Arverni. Caesar retreated to the Alps where he regrouped and eventually captured Vercingétorix at the siege of Alesia, northwest of Dijon. In order to prevent the massacre of his followers, Vercingétorix surrendered and was paraded in triumph through the streets before being incarcerated in the town of Tulles, where Caesar had him murdered five years later. Clermont-Ferrand is one of France’s oldest cities and was first recorded by the Greek geographer Strabo. The settlement was originally known as Nemessos, a Gaulish word meaning sacred forest and was centred round a mound where the current cathedral now stands. After the Roman conquest, the city became known as Augustonemetum, named out of respect for the first Emperor, Augustus (reigned 27BC – 14AD), yet later, and whilst still under Roman influence, it became Avernum. The well known 6th Century chronicler, Gregory of Tours (538-594) was born in Clermont, where he was later to become bishop. There are numerous references to the city in his works, Historia Francorum, The History of the Franks. During the early 8th Century the Auvergne was part of the dukedom of Aquitaine and was absorbed into the Carolingian empire under Charlemagne. In 848, Avernum changed its name again to Clairmont, a corruption of Clarus Mons, meaning the ‘bright mountain’, after the Normans attacked from the north, using the river Allier as a passage to conquer the region. Prior to this, many monks had fled to the Auvergne from northern France, seeking refuge, founding new monasteries and installing viniculture in the region. Evidence of their relationship with the vine can be seen in the priory in Souvigny, north of Saint-Pourçain-sur-Sioule, where an octagonal pillar carved from stone depicts a zodiacal calendar, with the month of September dedicated to the grape harvest. Feudalism in the 10th Century accounts for why there are over 500 fortified châteaux around the Auvergne, the result of a long period of lawlessness where the monarchy was not recognised, with local lords fighting the crown – and each other - in an attempt to maintain their independence. In 1095, Clermont was the starting point for the First Crusade after Pope Urbain II made an impassioned appeal for Christians to recover Jerusalem from the Muslims, wearing the sign of the cross on their apparel to confirm their allegiance. The arrival of the prefix of Montferrand dates its origin to 1120, when after repeated conflicts between the Counts of Auvergne and the Bishops of Clermont, the Counts established a new city on a separate mound facing Clermont’s fortifications. What began as a two city rivalry, Clairmont and Montferrand were forcibly united by the Treaty of Troyes in 1630, although Montferrand made three separate claims for independence, in 1789, 1848 and as recently as 1863. As part of the dukedom of Aquitaine, the Auvergne was to come under the control of Richard I, Richard Coeur-de-Lion (1157-1199), after it was granted to him by his father, Henry II, following Henry’s marriage to Eleanor of Aquitaine. But Richard was forced to abandon it in 1189, allowing Philippe Auguste, Philippe II, to create a new centre for administration in the town of Riom, which prospered as a result. By 1211, most of the Auvergne had been reunited under the French crown, but in 1337 the Hundred Years War began and, once again, the Auvergne came under the possession of the English. In Riom’s Hôtel de Ville is the Jean d’Arc museum, and its centre-piece is a letter written by the Maid in 1429 appealing for funds from the rich burghers of the town to help finance the campaign against the English at La Charité-sur-Loire. The rich people of Riom pledged 60 gold écus, but were slow to send them, causing La Pucelle to send them a letter of reminder. A hair, said to be from the head of Joan, had caught in the wax on the letter’s seal, although this has long since disappeared. Part of the Allier département falls within the ancient province of Bourbonnais. Under Charles VII (reigned 1422 – 1461), the dukedom was given to the Bourbons, and in 1589 Henri IV, the son of Antoine de Bourbon, duke of Vendôme and king of Navarre, became the first Bourbon king of France and certainly served wines from the Côtes de Clermont at his table, as did his grandson, Louis XIV, the Sun King (1638 – 1715). All this Bourbonnais patronage only helped to reinforce the market for Auvergne wine in Paris. Henri IVs descendants were to control France (except between the start of the Revolution in 1792 and 1814 when the monarchy was re-established) until 1830, when Charles X was deposed. Despite the end of the monarchy in France, Auvergnats have never been far from power, with the notorious politician Pierre Laval (four times Prime Minister of France; twice under the Vichy Regime), George Pompidou (President between 1969 – 1974), Valéry Giscard-d’Estaing (1974 – 1981), and Jacques Chirac (1995 – 2007) all originating from the region. The Auvergne always was something of a secret wine region, with less religious influence than many other areas of France. It is impossible to date when the first vines appeared, but we know that when Caesar conquered the Gauls half way through the first Century BC, there was no viniculture in the Auvergne, despite the wealth and sophistication of the Arverni. Evidence of an active wine trade during Roman times exists by way of the thousands of fragments of amphorae found around the Puy de Corent and is confirmed in the letters of Sidonius Apollinaris (430–489AD), where, in a letter to a friend near Clermont, he makes mention of the vines in proximity to his residence. Sidonius was a Lyonnais, born into a wealthy Gallic family, and he became governor and later bishop of Arvernum from 471AD until his death. From his villa on the shores of Lac d’Aydat, he wrote, whilst sipping ‘snow-chilled wine’, that ‘pastures crown the hilltops and vineyards clothe the slopes’. In the 11th Century it is believed that there were over 10,000 hectares of vines planted in the Auvergne, split into parcels of between 0.20 and 0.80 hectares each, involving vast numbers of vignerons growing a diverse selection of grape varieties. The vineyards were planted on sites up to 1,000 metres in altitude, but the cooling of the planet between the 17th and 19th Century resulted in vineyards planted over 600 metres no longer being viable. The wines of Châteaugay were appreciated in the court of Charles VI (reigned 1380 – 1422). His Chancellor, Pierre de Giac, established the Château in the town in 1381, and in 1415, the inhabitants of Clermont demanded that the King issue an ordonnance, to help protect the town against the wines from the surrounding villages of Aubière, Beaumont and Romagnat from entering the city. The accession of Henri IV to the throne saw a period of prosperity for Bourbon France, and demand for local wine increased. Bourgeois families began acquiring properties in the late 16th Century and this signaled the start of plantings around the villages (now suburbs of Clermont) of Chanturgue and Montjuzet (now an ornamental park on the northern edge of the city). A memoire published by M. Lefrèvre d’Ormesson in 1697 places ‘Chantourgue, Châteaugay, Pompignac, Mirefleur, Corent, Les Martres, Neschers et quelque autres lieux in the premier rang’, the ‘first row’ of communes, whilst a document from 1740 shows 13 different varieties were planted on the slopes around Clermont, with plantings split equally between red and white grapes. Increased demand, combined with improved navigability of the river systems flowing north meant that the banks of the Allier were heavily planted with vines. The wines were transported to Paris via the Allier and Loire on specially constructed 15 metre long flat bottomed barges called sapinières, each capable of carrying 15 tonnes of cargo. Rarer, were barges of 25 metres, which could hold 56 tonnes of goods - not only wine, but cereals, fruit, cheese and Volvic stone. They were constructed from sapin, pine sourced from the forests close to Issoire, Thiers and Brioude. Ports were constructed in many towns and villages, including Mirefleurs, Cournon, Dallet, Martres-de-Veyre and Pont-du-Château, all specifically to charge the barges with wine. The journey on the shallow, but fast flowing Allier would have been a perilous one and only possible at certain times of the year, either in the autumn after the seasonal rains, or again in spring, after the winter thaw that ensured the river was in spate. It took eight days from leaving Pont-du-Château to arriving in Briare, where a canal had been opened in 1642 to connect the Loire with the Seine. This was, of course, a one way journey - the Allier only navigable downstream. On arrival at the quai de la Rapée in Paris, the barges were either sold off or dismantled and used as firewood, leaving the boatmen to return on foot to the Auvergne. Navigation by sapinières was at its peak in the first half of the 19th Century; before transportation by train and coinciding with the period that the wines of the Auvergne were most in demand. In 1825, 40,000 pièces, around 12,000,000 litres of wine, were loaded onto barges on the banks of the Allier, destined for Paris, although it is certain that it wouldn’t always reach its destination in a saleable state; adulteration was common as mariner’s replaced pilfered wine with water during the long journey north. The arrival of the first railway in 1855 had a further dynamic effect on trade, allowing for a more rapid response to the demand which, in turn, created a new market via wine négociants. Whilst the journey by barge might take two weeks, it was now possible to travel from Clermont-Ferrand to Paris in just nine hours. Early in the 1800s, André Jullien, a renowned wine writer and author of the seminal 1832 vinous work Topographie de tous les vignobles connus, compared the wines of Chanturgue with those of ‘third class’ Bordeaux. It is not clear what grape variety Jullien believed these wines were made from, but his statement coincided with the period that Gamay was becoming the dominant variety in the Auvergne. During this period, viticulture appeared to be the only form of agriculture that was profitable. Gamay was no recent arrival in the Auvergne , it has been known to exist here since the Middle Ages, yet it was Pinot Noir, originally imported from the Lyonnais or Burgundy , that was the common grape of the region. But the hard winters that ravaged Europe between the 17th Century and early 19th Century, a period commonly known as the ‘Little Ice Age’ (in England the Thames often froze over in London between 1607 and 1814), that saw late ripening varieties, such as les pinots bourguignons, fall victim to change in climate. Gamay, with its early ripening and productive tendencies, offered vignerons a much more reliable alternative. In 1860 there were 25,000 hectares planted in the département, rising to 45,000 hectares by 1890 - twice the size of modern day Beaujolais and the same surface area planted to wheat in the Auvergne today. Vineyard plantings in the Puy-de-Dôme were enormous; after the Hérault and the Aude, the département was the third largest wine producer in France with Clermont-Ferrand performing the role as its wine capital, the continuous cordon of vines following the course of the Allier from Langeac and Brioude (both in the Haute-Loire) in the south through to Châteldon at the northern-most point of Puy-de-Dôme. The slopes around Clermont-Ferrand were a blanket of vines; in 1895 there were 740 hectares planted in Blanzat, and in Aubière it is documented that its 500 hectares supported 730 existants. But the wines produced were for consummation courante, delivering enormous yields. The mass of plantings ensured that quantity was more important than quality and the Auvergne managed to slowly loose its reputation during the late 1800s until Phylloxera finally managed to kill off any lasting reputation. illustrates the importance of the vine at this time. Encouraged by the demand for their wines, the Auvergnats refused to accept the possibility of an impending viticultural crisis and continued to establish more vineyards. Phylloxera was first identified in the commune of Mezel in 1868, just four years after it had been initially recorded in the Gard. The attributed source of the infection was amateur vigneron, M. Ligier de la Prade, who had been planting American vines since 1861. By 1875 the majority of the vineyards in the département were contaminated. In spite of this, the vineyards of the Puy-de-Dôme delivered their largest ever crop in 1885, amounting to 1.6 million hectolitres. In 1895, 17 hectares had been grubbed up as a ‘precaution’ against phylloxera, but it was too already too late. In the same year, fifty different experimental varieties were imported from America to experiment with non-vinifera stock, although by this time it had already been established that grafting was the only effective way of tackling the problem. Vine nurseries were established throughout the communes in order to propagate stock, but the process was slow and not guaranteed. Instead, impatient vignerons elected to replant with hybrids, such as Baco, Oberlin and Rayon d’Or, which only accelerated the Auvergne’s poor reputation. Prior to the arrival of the aphid, Mirefleurs, a village on the right bank of the Allier, had a total of 300 hectares of vines planted, one third of the commune’s agricultural land, extending onto the flank of the Puy-Saint-Romain which, at over 700 metres altitude is much higher that would normally be considered possible to achieve full maturity of the fruit. By 1914, plantings had fallen back to just 99 hectares, and by 1950 this had halved again. Today, Mirefleurs has only a single hectare of vines, shared between four elderly part-time vignernons. There was a minor revival in the first decade of the 1900s, but attacks of mildew, frost, rain and, in 1904, drought, all resulted in ruined production. Despite the successful vintages of 1907 and 1908, vignerons were never to witness the prosperity enjoyed by their forebears in the 19th century, and by 1912 the vineyard area was now in serious decline. There was no replanting of vineyards either during or immediately after the Great War, and as Clermont-Ferrand developed into a major centre of industry, many growers abandoned their land in preference for the reliable salary offered by the likes of Michelin. Equally, as the city grew, many of the viticultural villages, such as Cébazat, Blanzat, Aubière, Romagnat and Beaumont were simply engulfed by urban sprawl, putting further pressure on vineyard land, with many maisons des vignerons lost in the process. In the 1950s there were still a dozen growers in Aubière working in the quartier des caves, a total of 135 vaulted cellars built above the village between the 17th and 19th Centuries to accommodate the harvest and vinify the wine. Although evidence of the vine’s existence in the region has long since been lost as the slopes have been developed for other forms of agriculture, there are, however, many maisons des vignerons to be found in every town and village. The design model changes little between the various communes; a small, stone built cuverie on the ground floor, accessed through a wide door will lie over an underground cellar, often hewn out of the volcanic rock. Outside, a staircase rises up to a covered wooden balcony, the vigneron’s living quarters. Many of these modest houses are now being restored, either as maisons secondaires, or by the local mairie, as a record of a past existence. In an attempt to regain its reputation and plantings between the First and Second World Wars, an initiative by Jean-Claude Noëllet, the mayor of Aubière, saw the opening of the Puy-de-Dôme’s first co-operative, la Clermontoise, in the town in 1935. It allowed growers to share in newly developed cellar technology and in equipment that was created specifically for greater mechanization in the vineyards. This was followed in the region, two years later, by the creation of the Syndicat agricole et viticole. Post Second World War, the region’s growers established the Confrèrie des Compagnons du Bousset d’Auvergne; created in 1948, its aim was to defend and promote the wines of the Puy-de-Dôme and the Auvergne in general. A second co-operative, originally called the Cave des Coteaux and now known as the Cave Saint-Verny, was established in Veyre-Monton in 1950. A year later, the region received V.D.Q.S. status, which was subsequently revised in 1977. Despite the official recognition, the Côtes d’Auvergne was in perpetual decline during the last half of the 20th Century, with the la Clermontoise co-operative closing its doors in 1982. Less than a decade later, the Cave des Coteaux almost went the same way, but was rescued by an ambitious financial investment by Limagrain, Europe’s largest seed specialists. The demands for upgrading to full Appellation Contôlée status had been ongoing since 1986, and finally happened during the 2011 harvest when, as part of E.U. legislation, the classification V.D.Q.S. became obsolete. Qui est de tout Clermont les plus beau, le plus noble. The Auvergne, as a region, straddles the 45th Parallel, with the vineyards sharing the same latitude as Côte Rôtie and Saint-Emilion, but its potential to become the next La Turque or Cheval-Blanc will never be realised due its elevation; the vines sit at between 350m and 570 metres, the altitude making the region unsuitable for late ripening Syrah or any of the Bordeaux varieties. The vines sit on the north-eastern border of the Massif Central, at the very limit of méridonal viticulture in France. They stretch along the eastern edge of the Chaîne-des-Puys for some 80 kilometres, running vertically between Riom in the north and Saint-Germain-Lembron, south of Issoire. Vines can also be seen down on the Limagne plain, traversing the river Allier and approach the slopes of the Monts du Forez on the opposite side of the valley. Whilst plantings might have contracted severely since the boom years of the late 1800s, the vines that remain are at least orientated on the better south and south-east facing slopes, mostly in often isolated pockets, a legacy of the polycultural farming tradition that has evolved in the post-phylloxera era. Any return to the monoculture of the 1800s is now all but impossible in some places, due to the encroachment of urban sprawl onto what were once the best vineyard sites. Whilst the Auvergne looks south for its linguistic influence, its climate has more in common with Northern France dominated, primarily, by the weather patterns of the North Atlantic. During the summer months, west or southwest winds prevail, bringing rain to the western slopes of the Massif Central. Relief and altitude, however, play a huge role and further to the east the vineyards are sheltered by the Chaîne-des-Puys, and expect an average rainfall of just 530mm to 550mm per year; about the same as the Midi and twice as much as the western Auvergne. Winters are more typically Continental; bitterly cold, with heavy falls of snow above 1,000 metres. Any Mediterranean influence is generally experienced in spring, which arrives late in these parts, but warm currents occasionally break through the barrier of the Cévennes, helping to start the thaw and put the Allier in spate. The same winds are equally capable of carrying summer storms along the Limagne basin, when hail becomes a real threat. Autumn months are long and dry allowing for an extended and mostly trouble-free harvest. Average annual temperature is 12 degrees centigrade. The topography of the region combined with its turbulent volcanic past ensures that there are a complex array of soils and subsoils, even within the same commune. With the majority of the vineyards situated on the slopes, they are at least generally dry and well drained, to the point that water stress is more likely to be a problem than water-logging. During the creation, of the Limagne basin, some 20 to 12 million years ago, the river Allier and its tributaries filled the valley floor with alluvium deposits which were interspersed with cinders, lava and ash, making this one of France’s most fertile plains. Back on the slopes, the bedrock is alkaline basalt (weathered lava), exposed through erosion and rich in minerals. The top soils range from argile-calcaire and granite. In certain places, there is the detritus from where volcanoes ejected massive amounts of lava, volcanic hailstones and cinders over many kilometres. Lava also flowed over the original clay and limestone subsoils to form the hills, puys and plateaux of Gergovie, Chanturgue, Châteaugay and Corent. Famous throughout France is the town of Volvic, which sits on a bed of andesite, a black lava so hard that it was impossible to be cut until the invention of steel tools in the 13th Century. Volvic stone is impermeable to the point that it was once used by Michelin for their famous road signs. There are currently 54 communes that are allowed the appellation Côtes d’Auvergne, with a further five sub-regions designated as Crus; running from north to south these are: Madargues, Chateaugay, Chanturgue, Corent and Boudes. These have all historically been recognised as the best sites, with Châteaugay first mentioned in the 16th Century. Combined, the five crus account for around 180 hectares of the total plantings, or approximately half of all vineyards sold under the appellation as a whole. As well as carrying specific geographical status, the crus are also obliged to contain a natural of minimum 10.5% potential alcohol (the generic wines need just 10%) and a maximum yield of 52hl/ha (as opposed to 55hl/ha). 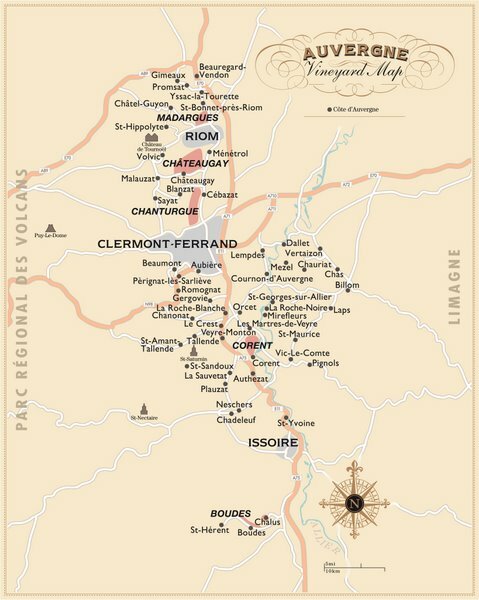 The balance of the vineyard area takes the generic appellation title and these are mostly situated around the communes to the south of Clermont-Ferrand, either on the slopes, or on both banks of the river Allier lower down on the Limagne plain. Whilst not officially acknowledged, the slopes and orientation of several communes deserve special mention; Volvic, for the position and the free draining granite soils below the Château de Tournoël; it deserves to be recognised as a cru in its own right. Then there is Montpeyroux, which actually falls under the commune of Authezat, for its magnificent terraces of red, arkose granite overlooking the Allier, and Neschers if, for nothing else, its potential to replant abandoned slopes and revive its vinous past. Working from north to south, the first cru to be encountered is Madargues, colloquially known as Le Pays Brayaud, and was once famous for the production of Vin de Paille. The vines planted are situated on the plateau that separates Saint-Bonnet and Châtel-Guyon, with some well exposed south facing slopes at between 320 and 420 metres that offer some splendid views over the town of Riom. There are approximately 15 hectares in production, although the planting rights for the cru allow for three times this amount, with vineyards once extending as far as the hamlet of Yssac-la-Tourette further to the north. Madargues is unusual within the region as it has no volcanic elements in the make-up of its soils. Instead they are made up of heavy clay, mixed with fine particles of sand and limestone, collectively known as gréseux. There are vines planted around the foot of the plateau, but these are on sandy soils and are only entitled to IGP status. In the late 1980s an attempt was made to attract vignerons back into the arrondissement and the Riom municipal council, in conjunction with the Fédération Viticole, instructed the mayor of the town to redevelop an old vineyard site. The responsibility of the three hectare parcel between Riom and Saint-Bonnet was given to Bernard Boulin and Jean-Michel Déat, who were also given rights to make and bottle the production. Planting started in the spring of 1989. Historically recognised for the quality of its red wines, the vines of Châteaugay are situated between the two conurbations of Riom and Clermont-Ferrand. From the plateau it is possible to look directly down onto the testing circuit of the Michelin tyre factory. At around 80 hectares, this is by far the biggest cru, as well as the most concentrated vineyard area in the entire appellation. In 1809 an ordonnance conducted at the order of Napoléon, showed that the south-east facing terraces around the town were completely covered. Evidence still exists, and whilst plantings in the cru have remained constant over the past century, the vines have slowly migrated down the slope to allow for ease of access and allow for greater mechanization, exposing abandoned terraces on the higher ground in the process. The soils here are complex and varied, the basalt-capped plateau being peppered with the glass-like lavas of obsidian, perlite and pitchstone. Elsewhere one finds vesicular basalts, marl and granitic sand, whilst the most revered lieu-dit of all, Bourrassol, the closest vineyard to Riom, is planted on limestone. Soil on the lower levels is made up of pépérites, small basalt pebbles created when water mixed with lava, which have the appearance of cracked black peppercorns. Here, the dark appearance of the rock allows the soil to quickly warm up and re-radiate the heat back onto the vines during the course of the evening, with the fractured texture also allowing for easy drainage. It is said to offer a smoky quality to the resulting Gamay based wines. Recognised since the Middle Ages, Chanturgue is the oldest and most famous of the crus, but at around only 3.5 hectares, it is almost impossible to locate, hidden away as it is, on an east facing slope overlooking Clermont-Ferrand’s northern suburbs. It takes its name from the plateau to the north of the city, but has virtually disappeared due to urbanisation. One parcel that still exists resembles little more than a private garden vineyard, interplanted with cherry trees and a little cabine in the centre. One can imagine some part-time vigneron escaping the Michelin factory floor of an evening to the refuge of his hut, or tending to his vines. In a survey conducted in 1835, the vineyard area extended to the slopes of Montjuzet (now parkland), the Côtes de Clermont, the Puy de Chanturgue, the Puy de Var and certain parcels in Cébezat, Landat, la Fontcimagne, la Sarre, les Paulines, Saint-Jean, l’Oradoux, Rabanesse, Beaupeyras, Gravouses, Tardière, Valière, as well as numerous plots in residential quarters. A further survey, conducted in 1854, showed how highly fractioned vineyard area was, with 769 individually identified parcels spanning 17 hectares of vines. The soils within the greater area are similar to those found in Châteaugay and the commune of Cébezat which, in theory, qualify for both Chantugue and Châteaugay cru status. The 32 hectares of vineyards Corent are actually made up of vines in four communes, Les Martres-de-Veyre, La Sauvetat, Veyre-Monton and Corent itself. The village sits on the side of the Puy de Corent, high above the left bank of the Allier and is built on the foundation of a Gallic oppidum, established a century before the birth of Christ. The puy itself is 628 metres high at its summit and resembles the hill of Corton. Whilst vines are no longer planted continuously around the entire hill, they can be observed as small parcels on every orientation, including the slopes that face north. The most concentrated plantings, however, are on the south facing slope and these tend to ripen a week earlier than those to the north, but are at greater risk from hail damage, due to their exposure to summer storms that blow up from the Mediterranean coast. Corent is celebrated for its fragrant, onion-skin coloured rosés, which partly explains why vines are grown on the cooler slopes. Its reputation goes back to the time when the wines travelled by barge along the Allier towards Paris. Corent enjoyed a privileged position, having its own port on the river at Les Martres-de-Veyre, and it was soon discovered that it was rosé wines that proved to be the more durable due, essentially, to their slightly higher acidity and alcohol, which acted as natural preservatives on their journey north. The soil here is made up of arkose, essentially reconstituted granite made up of feldspar, quartz and mica, outcrops of which can be seen along the banks of the river Allier, where the river rushes through the gorge below the village. On top of the arkose one finds marl-limestone, as well as lightweight rocks called pouzzolanes which is composed from porous volcanic ash. The Puy-de-Corent. Its south-facing slopes can be seen to the right of the hill. Known as Buciacenis in the 11th Century and Bosdes in the mid 13th Century, the vineyards of Boudes were historically developed by the clergy and the bourgeoisie. The cru is made up of vineyards within the three communes of Chalus, Saint-Hérent and Boudes, although the vast majority of its 45 hectares are found on the south facing slopes which over look this pretty medieval village. At around 570 metres, these are the highest vineyards in the Côtes d’Auvergne. The soil profile in Boudes is different to any other found in the region. Vineyards on the northern side of the valley are planted on clay, marbled or veined with different colours, ranging through red, grey, green, yellow and pink, whilst crystalline limestone runs in bands with fragments of basalt appearing on the highest slopes which are topped with an elongated plateau of basalt; lava that originated from the volcano of Ranoux some ten kilometres to the west. These are well drained vineyards, due to their gradient, but this is also one of the few remaining villages within the Côtes d’Auvergne where vines can still be seen planted on rocky terraces and trellised using the traditional single échalas stake. There are some parcels of vines planted on the plateau to the north of the village, on a slope known as the Coteaux de Bard, although the sand and granite soils ensure the profile is different again. There are about half a dozen growers who are solely dedicated to making Vin de Pays (now IGP), running in a ten kilometre band either side of the Allier. The designation allows for red and rosé produced from Pinot Noir, Gamay and Syrah, which is known locally as ‘Petite Syrah d’Auvergne’ and has been replanted using cuttings taken from very old vines within the département. The rosés tend to be declassified Côtes d’Auvergne where the residual sugar is greater than two grams per litre; more than permitted for the appellation. White wines are produced from Chardonnay and Sauvignon Blanc. In 2009, there were just in excess of 50 hectares of declared plantings, although this has since risen as Pinot Noir producers began to declassify their wines following the enforced changes during the elevation to AC status. The following three communes are listed as existing vineyards in Vignes et Vins de France published in 1962. This medieval village lies on the eastern edge of the Limagne, close to the confluence of the rivers Allier and Dore. It is famous for its naturally carbonated mineral water; the first to be commercialised in France. It’s most famous client was Louis XIV who had bottles transported to the Royal Court in Versailles in the mid 17th Century. It sits on the eastern flank of the Montagne Bourbonnais and its east facing slopes would have been an ideal location for vineyards. Although the planting of vines probably predates the 16th Century, it was during this period that Châteldon’s wine industry began to flourish, with easy access to the Paris market by way of the Port-de-Ris, situated on the river Allier just a few kilometres away. The downfall came, like everywhere, with the arrival of phylloxera, seeing vignerons turning to forestry and developing pine plantations instead. Evidence of vineyards still pervades the slopes, with significant numbers of evasive rootstock now growing wild. The last vineyards are said to have disappeared in the 1950s, more recently, however, the mairie has set about restoring some of the old 17th Century maisons des vignerons, a series of stone built houses with cellars below. Châteldon’s most infamous resident was Pierre Laval who was born in the village in June 1883. Laval served four times as President of the council of ministers and twice as the head of government in the Vichy Regime. He came from a modest background, his father being the village butcher, postman and café proprietor who also tended a few acres of vines. He started with a modest education in the village school, but went on to study in Paris. During his political career, he returned to buy Château de Châteldon in 1930. He was executed by firing squad in October 1945 after being found guilty of high treason. It’s a pretty place, reminiscent of a Cotswold village, with numerous half-timbered buildings and has its own 14th Century tour d’horloge, surprising for such a modest sized community, and is certainly worth a detour. Despite no current evidence of viniculture, Châteldon still holds a one day wine festival every October. It is said that Thiers owes its belongings to Châteldonian’s fleeing from the ravages of the Hundred Years’ War and the Black Death of 1348. As a town, it would be best suited to twinning with Sheffield, given that its cutlers supply 70% of France’s cutlery needs. The waters here have special non-calcareous properties necessary for the manufacture of steel. Although mentioned as a wine producing region in the early 1960s, there is no evidence today of any commercial vineyards. Ris is a sleepy little hamlet, based around its early 11th Century church, which is all that remains of a priory first established in 978. It is situated just a few kilometres to the north of Châteldon. At one stage, vineyards would have run continuously between the two villages, and evidence exists in an old wine press that can be seen on the road entering the village. A document from 1740 shows that there were 13 different varieties harvested in the Côtes d’Auvergne, with plantings split equally between red and white grapes. Today, red grapes account for around 90% of all plantings. Gamay is an ancient variety in the Auvergne, recognised since the Middle Ages although not widely adopted until the early 19th Century, replacing Pinot Noir for its more reliable crop and greater productivity. It now accounts for about 85% of all plantings. There are two different Gamays available to growers; Gamay Noir à Jus Blanc, also known as Gamay-Beaujolais, and Gamay d’Auvergne. The former has become more favoured over the past three decades due to its smaller berries and quality potential. This is now the dominant plant, with about half a dozen clones available through the Institut Technique du Vin at Villefranche-sur-Saône in the Beaujolais. The traditional vine is the Gamay d’Auvergne which is specific to the region and notable for its loose but large berries arranged in neat, well aerated bunches which ensures it was less susceptible to mildew. It works well on basalt soils and whilst it is still mostly propagated via sélection massale, there are two clones generally available to those who wish to continue with the tradition. The Gamay Teinturiers, Bouze and Freau, exist by way of a few random plantings, but are outlawed for the Côtes d’Auvergne appellation although permitted for Vin de Pays-de–Dôme. It is widely accepted that Pinot Noir was the variety most widely distributed prior to the 19th Century. Originally imported from either the Lyonnais or Burgundy, it was known in the region as Auvernat Noir (as it still is in Orléans), Charpineyre and Neyrou, but it was the hard winters between the 17th Century and early 19th Century, a period known as The Little Ice Age, that saw it fall out of favour as demand for wines from the Auvergne increased, growers looked towards the more productive and reliable Gamay as a substitute. It is generally the first variety in the region to be picked and it is used for both red and rosé wines. Despite its loss of status, since 2008, as a stand alone variety within the Côtes d’Auvergne, plantings are still increasing, although there are some questions over the quality of the material that is available within the region. Known locally as Auvernat Blanc or Pinot-Chardonnay, it accounts for between 5 and 10% of all vineyard plantings. It is neither an historic or distinguished vine in these parts, with few exceeding 30 years of age, although there are records of it in the commune of Sauvagnat-Sainte-Marthe north of Issoire that date back to the early 1960s. The current trend is for more plantings as demand for white wines within the region increases. As to when it is harvested, this is dependent on the altitude at which the vines are planted, the exposition and the type of soil. Not permitted for the Côte d’Auvergne appellation, but allowed for Vin de Pays de Puy-de-Dôme. Given the 45th parallel dissects the region, as it does in the Rhône, it is not surprising that experimental plantings of Syrah are on the way up, in some forlorn hope that growers may be able to take advantage of global warming. The grapes are harvested around the same time as Gamay. Noir Fleurien, or Mirefleurien, is an ancient local variety that was mentioned in Le Vignoble Auvagnat, written by E. Goutay in 1908. It states that the variety is more fertile than Gamay and resistant to mildew and chlorosis. It was grown exclusively in the commune of Mirefleurs, on the right bank of the Allier, although had spread through the département where isolated parcels could be found. Unfortunately, the resulting wine was weak in alcohol, tannin and acidity, so only suitable for immediate consumption. The variety produces multiple bunches of small berries and is apparently capable of producing interesting wines if yields can be kept below 30 to 35hl/ha. Today, two or three vignerons in Mirefleurs maintain the variety for making wine for their own tables. In addition, there are 2.35ha registered in the commune of Saint-Georges-sur-Allier. At the end of the 18th Century, other varieties to be documented in the region include Frayer, Lyonnais, Chanis, Rousselet, Pinatel, Damas Blanc, Limberger, Canari, Portugais Bleu and Anis Blanc. Pinot Blanc was also written into the decree when, in 1932, the Tribunal of Riom created the provisional legislation of ‘Vins d’Auvergne’, along with Gamay and Pinot Noir, although there is no evidence of its existence within the region. Vine density shares the same legalities for all three varieties. Traditional plantings methods exist at 9,000 vines per hectare (1.0 to 1.3m x 0.90 to 1.0m), although vineyards established in the 1970s onwards are more likely to be set out to between 2.0m and 2.6m and 0.90m x 1.0m to allow for greater mechanization; about 80% of the vineyard area is said to be harvested by machine. The legal minimum is 4,400 vines per hectare. Rarely, but notably, on some of the terraces in Boudes, the trellising is by a system known as échalas where vines are trained onto a single wooden stake, as is commonly encountered in the Northern Rhône. When adopting this ancient method (the Boudes plantings are in vineyards that are over a century old) one would expect, although not necessarily realize, plantings of 10,000 vines per hectare. The most popular graft for Gamay is rupestris, although SO4, noted for its productive qualities was widely used in the 1960s and 1970s. Like vine density, pruning methods are shared for all three permitted varieties. Although some white wine is produced within the Côtes d’Auvergne, this is essentially a region for growing red grapes. What Chardonnay is produced follows one of the two styles generally encountered; the first, a simple tank fermented wine that is correct, but little else, or the second method which follows a classic Burgundian model of barrel fermentation and ageing. The decision to make white wine at all is as much to do with the demand from private clients who want something as an alternative to red, but seldom do the white wines leave the region, and for the most part, there is no unique reason why they should. The demand for rosé, or gris, is strong, but also follows fashion and for the moment Côtes d’Auvergne rosé is ‘in’. It’s hard to put an exact figure as to how much Gamay or Pinot Noir is vinified pink, but most producers cite that it is between 10 and 30% of their total production, but can fluctuate from season to season. The technique of pressurage direct is the most common and is indeed obligatory for any wine labelled as gris. It also is more reliable than either maceration or saignée as growers are at risk of loosing the right to the appellation if the wines appear too light or too deep. The appellation law also states that the wine should be dry, so any wine that carries more than 2g/l residual sugar is refused, although the option exists to declassify to Vin de Pays de Puy-de-Dôme. Minimum alcohol content for Côtes d’Auvergne and Vin de Pays is the same at 9%, but needs to achieve 9.5% for any of the five crus. There is a maximum alcohol of 12.5%, if chaptalisation is necessary. Pinot Noir plays a part within blended wines, whereas before the revised legislation of 2008 it could be mono-cépage, much to the chagrin of some growers who made a point of selling a single variety Pinot Noir. For those who wish to persist, the option is to declassify to IGP status, and for a grower like Michel Blot in Boudes, this is indeed the only option, as he believes that blending Pinot Noir with Gamay offers nothing to the wine, and is little more that a compromise. A handful of growers in the region make a little Vin de Paille, stating that the production in the Auvergne pre-dates that of the Jura (or Hermitage). It was made for personal consumption, although there are theories that it was also made by the local clergy from grapes donated by God-fearing vignerons and poured as sacramental wine during religious ceremonies. A good all round vintage, making four consecutive good years for the region. A very good quality vintage, although the harvest in some areas was small due to frost, and generally late due to cool conditions during the summer and some rain in August which delayed phenolic ripening. The grapes came in from the end of September, with some growers still harvesting in late October. Some had to deacidify in the cellar to combat the high levels of malic acid. Not a particularly distinguished vintage with Pinot Noir performing better than Gamay. The co-operative, already working to fairly parsimonious yields averaged between 25 and 30hl/ha this season. A ‘normal’ year without excess, although one grower lost 50% of the crop due to hail damage. Described by Olivier Mignard, oenologue at the co-operative, as a ‘feminine’ vintage. A challenging vintage with a large crop that ripened very quickly. Harvest started on the 2nd September. This, like everywhere, is a low acid vintage and the wines are now beginning to tire.